yes...i know...i am still behind on my posts and have still have some restaurants from my phoenix trip that i really want to discuss still. i will get to it at some point...but until then, i just wanted to share some of the food i've been making. they are inspired by what i love to eat and hopefully these are things you love too! eggs...not just any old egg! soft, runny yolk eggs...my favorite! when i was growing up as a kid, i remember rushing around in the morning trying to get ready for school and my mom used to make us fried eggs. Lord those eggs were super well done! the whites would be super duper crispy, and even though i like crispy, that wasn't appealing to me, and the yolk was so hard...i found it to be unappetizing and unedible. what a ungrateful child huh?! haha well, what can i say, i already had a discerning palette at such a young age. =) oh...and my mom would always put a little soy sauce on the eggs for some flavor. again...this just didn't cut it for me. after i cut it open, the runny yolk was able to run out, and is terrific when sopped up with a piece of buttered toast. with sottocenere black truffled cheese, d'espelette pepper, sliced italian black truffle, truffle oil and kosher salt. both of these eggs are just decadent and oh so yummy. 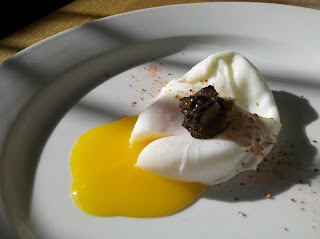 the creamy yolk was so rich and as it oozed onto the plate over the little sprinkles of kosher salt and pepper, it just added that extra little hint of flavor, along with the earthy truffle oil and that little bite of actual truffle. 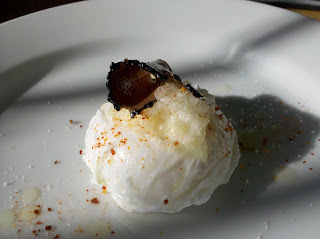 the cheese brought even more richness and continued to just enhance the flavor of the black truffle. as you take a bite of all of it together and kind of breath in...you just have to close your eyes as you smell and taste the fragrant black truffle. i gotta say, this is how everyone should start their day! yum yum yum! 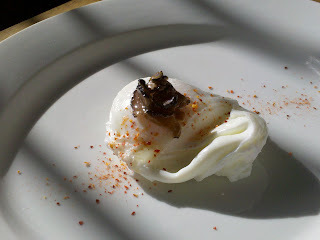 there are so many ways you can enjoy eggs...and i just wanted to share one from my point of view. 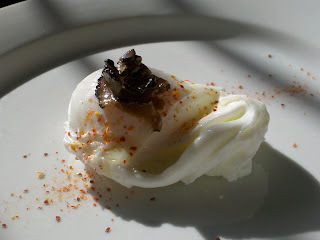 eggs done correctly can be such an amazing and rich experience! this was definitely decadent and delicious and not everyone is going to run out and buy italian black truffles...but you can purchase black or white truffle oil and drizzle a little on your next egg!